Home Recipes	The Best Balsamic Ever! Happy Thursday, Friends! Today is sort of a throw back Thursday as I’ve shared our favorite olive oil store once before. It’s The Tubby Olive located at 6 West State Street in Doylestown, Pennsylvania. But we discovered our new favorite balsamic vinegar quite by accident! Sometime last year my husband and I were walking around charming downtown Doylestown and stumbled upon a cool little shop called The Tubby Olive. They carry a wide assortment of gourmet oils and vinegars on tap. Some are aged for as many as 18 years! So, we bought a few different bottles of olive oils and a balsamic just to try it out. We loved all of it! So much so we went back and bought more and even bought some for our boys as a stocking stuffer. We meant to buy a bottle of regular balsamic vinegar but by accident picked up a bottle of Sicilian Lemon Balsamic. My husband and I love salads so we decided to give it a shot since we had it on hand. It is delicious!! What a happy accident! The other night we had a big salad and grilled salmon for dinner and topped it all off with the Sicilian Lemon Balsamic. It was so light and fresh! A perfect warm weather dinner. We like to season our salmon with fresh squeezed lemon and this balsamic vinegar was the perfect dressing and finishing touch. 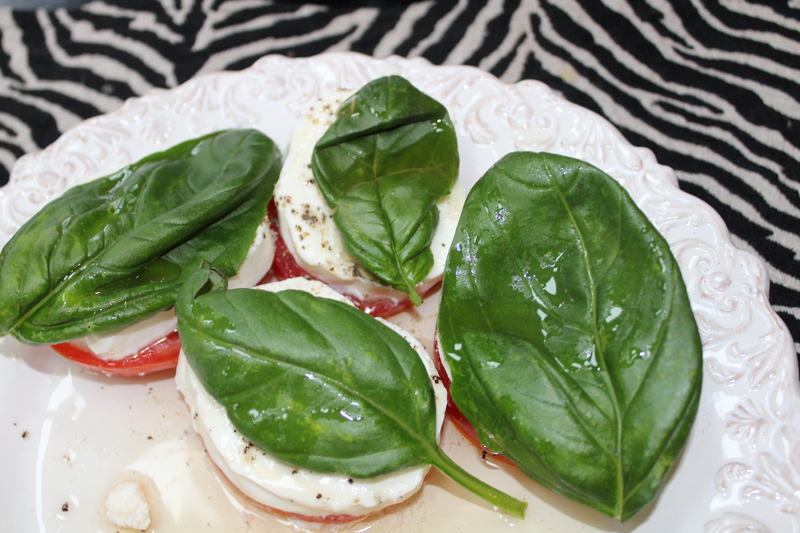 We even tried it on our Caprese Salad last night and it too was yummy! We ate a few before I remembered to snap a picture. Aren’t these basil leaves enormous? So, if you enjoy cooking with nice quality olive oils and vinegars, you should give The Tubby Olive a try. You can also order online at www.tubbyolive.com and they will ship anywhere. Or, maybe you have a gourmet olive oil store in your area that may carry something similar. We bought a few extra bottles to take with us in case we can’t find it near our new house. Because my husband and I enjoy cooking we love to find new things to try and we are so happy we discovered this balsamic. It will become a staple at our house from here on out!